Cornwall’s Loop the Loop project has received funding from both Arts Council England (ACE) and Heritage Lottery Fund. Each phase of the project has introduced experimental art to new audiences and has embraced animation, manga drawing, jazz, pop up musical performances and film making. The idea for Loop the Loop came when artist and library user Dr Joanna Mayes had a conversation with a staff member at St Ives Library about libraries as safe spaces to introduce people to new ideas. This led to the original Loop the Loop project which had a strapline of 'Creative adventures inspired by books'. This project ran in a leisurely fashion for two weeks. The first week focused on exploring books and the choices libraries make in selecting, keeping or withdrawing them. Jo took film on a 16 mm camera, processed it (with coffee) and displayed the results on the library’s information screen. This set the scene for the second week when there were drop in workshops on film making, animation and drawn puppetry. Michelson Morley, an experimental jazz group, worked with a Reading Group to create a musical response to some of their favourite passages. The success of this phase in terms of increased visitor numbers and positive feedback led to further phases. The second phase focused on art and local heritage, particularly mining and the railways. This phase saw ukeleles in St Austell, an animation workshop at Redruth and a temporary, pencil-drawn railway mural in Bodmin. The railway theme has been taken a step further with the third phase, ‘Branching Out’, which links branch libraries and branch lines. This was funded by Heritage Lottery Fund, Great Western Railway and Bournemouth Symphony Orchestra with support from Cornwall Libraries. A combination of workshops and train trips has resulted in poetry and prose about journeys; artwork based on the poster advertisements of the original Great Western Railway; and a pop up musical performance, performed at Liskeard Library and Liskeard station, from a community music group working with Patrick Bailey of the Bournemouth Symphony Orchestra. 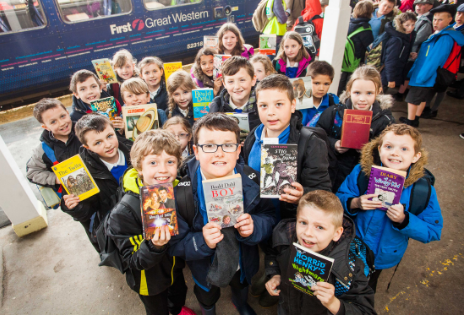 On World Book Night staff from Liskeard Library gave away books in the station café and hosted a pop up library. The Branching Out phase was partnered by the Devon and Cornwall Rail Partnership and won an award in the best Community Engagement Project category at the National Community Rail Awards. We have just been offered a grant by ACE for one further phase with a working title of ‘Only Connect’. The aim is to involve the community groups that already use libraries in new creative activities. We hope to include such groups as Home Library Service volunteers, Knit and Natter, and reading and writing groups. After three phases the Loop the Loop strapline is now 'Creative adventures inspired by books, research and heritage' as the vision for the project has widened. However, throughout there has been a theme of connectivity: of linking different groups, communities and interest groups. Loop the Loop has also raised the profile of libraries as cultural spaces within their local communities. The project has not been without its difficulties. We were working with a number of artists. Ensuring that everybody was available as planned before a firm funding offer was in place was difficult. In each phase this led to juggling of dates and events, and last minute changes to publicity literature. It was a learning curve for the artists too, especially for those who were not used to working with local authorities. For some artists, the Safeguarding procedures, the procurement and audit requirements, and the Health and Safety concerns of local authorities were unexpected obstacles. Staff at every level were at first unsure of the value of this new use of library spaces. However, the very positive result has been an active three way engagement between artists, libraries and the local community. The Loop the Loop programme continues with activities in Saltash, Liskeard and Looe in November. 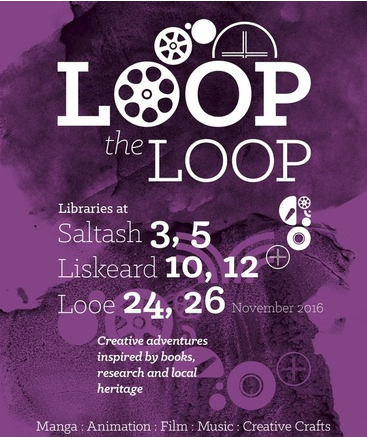 The Loop the Loop programme continues with programmes in Saltash, Liskeard and Looe in November. More information, including links to films arising from the first two phases of the project can be found at www.loopcornwall.com. Does anyone know what has happened to this project or any of the filming they did? I mailed the blog post author when you posted your comment, but haven't heard about any follow up. If you are still interested, you could perhaps contact the Loop the Loop team direct? According to their poster, they had activities planned through November.